Effectively stops all malware and other online threats reaching your device. 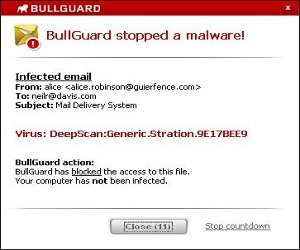 With its Antivirus module, BullGuard Internet Security is the perfect defence against the flood of malware that assails computers, laptops, Macs and Android devices. It protects against viruses, worms, trojans, adware, scareware, and other malicious programs so you are always protected. It also keeps out ransomware so you won’t fall victim to cyber blackmail. Managing your security couldn’t be easier. The all-new design of Internet Security makes it child’s play. Each feature has its own module panel. You simply click for the desired action and it happens automatically. All the modules are on one page so you can see at-a-glance your devices security status.